If you are a regular user of WhatsApp then you must be having a similar thought. Since WhatsApp can have our important personal chats or work conversations, it is always recommended to maintain its backup. 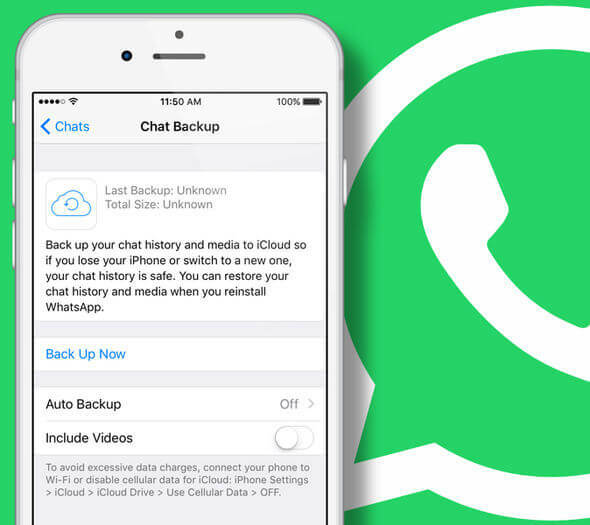 Now, you can easily do WhatsApp backup iPhone or Android and that too in different ways. In this guide, I have handpicked the 5 best solutions to backup WhatsApp data. One of the best ways to backup and restore WhatsApp data is by using dr.fone – Restore Social App (iOS). It is a part of the dr.fone toolkit and provides a quick one-click solution to backup WhatsApp chats and attachments. 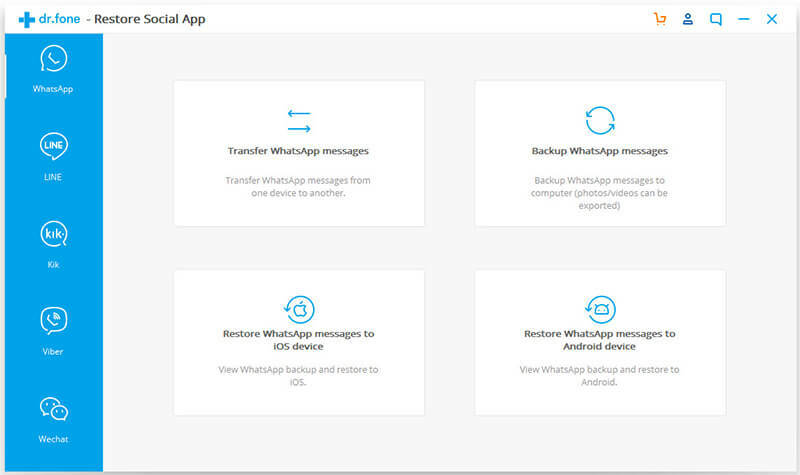 This means, you can backup WhatsApp photo and videos directly to your device. Later, you can even preview the backup content and restore it to your phone. 1. Launch the dr.fone toolkit and pick the Restore Social App feature from its home. Also, connect your iPhone to the system using an authentic cable. 2. Go to the WhatsApp tab from the left and choose to backup your WhatsApp data. 3. 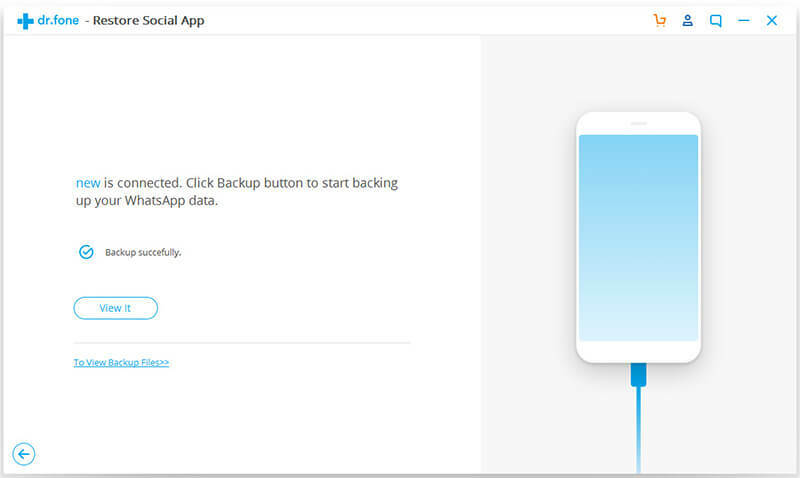 The application will automatically start taking a backup of your data. Simply wait for a while for the backup process to be completed. 4. As soon as it is successfully completed, you will be notified. To check it, click on the “View it” button. 5. The interface will display the saved backup files with their details. You can simply view the backup of your choice. 6. As you can see, all the chats and saved media files will be displayed on the interface for you to preview. If you want, you can directly restore WhatsApp data from here as well. In this way, you can easily backup and restore your WhatsApp chats with a single click and always keep your data safe. This is a native solution that is provided by WhatsApp on iOS devices. 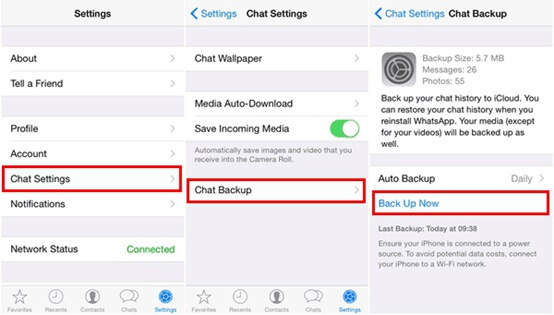 If you have enough free space on your iCloud account, then you can easily take a backup of your WhatsApp chats on it. Though, the process to restore WhatsApp chats might not be as seamless as dr.fone – Restore Social App. Unlock your device and launch WhatsApp. Go to its Settings by tapping on the menu icon. Visit Chat Settings and tap on the “Chat Backup” button. Manually take the backup of WhatsApp data or turn on the automatic backup option. You can also choose if you wish to backup videos or not. In this way, a backup of your WhatsApp data would be maintained on iCloud. Later, you can restore the backup by installing WhatsApp on the same device and signing-up with the same phone number. If you want to maintain an offline backup of your WhatsApp chats, then you can take the assistance of iTunes as well. This will take an extensive backup of your iPhone. That is, besides WhatsApp backup iPhone, your device’s photos, videos, contacts, messages, etc. would also be saved. Connect your iPhone to the system and launch iTunes on it. Select the connected device and go to its Summary tab. 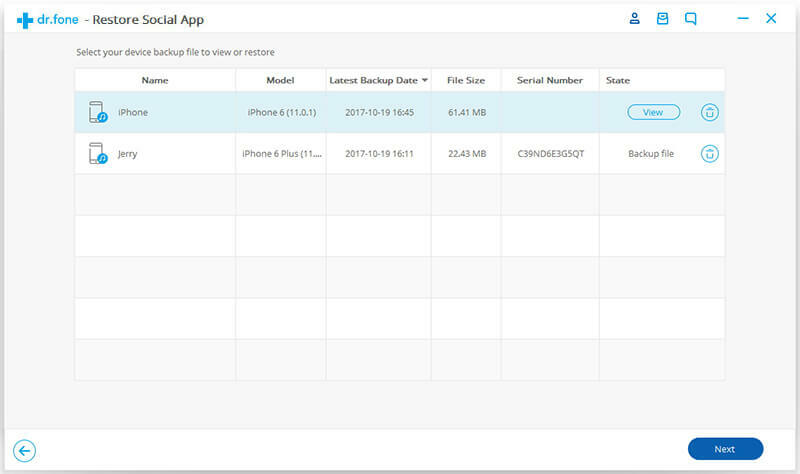 Under the Backups section, you can find an option to take a backup of the device on iCloud or the local system (This Computer). Select the “This Computer” option. 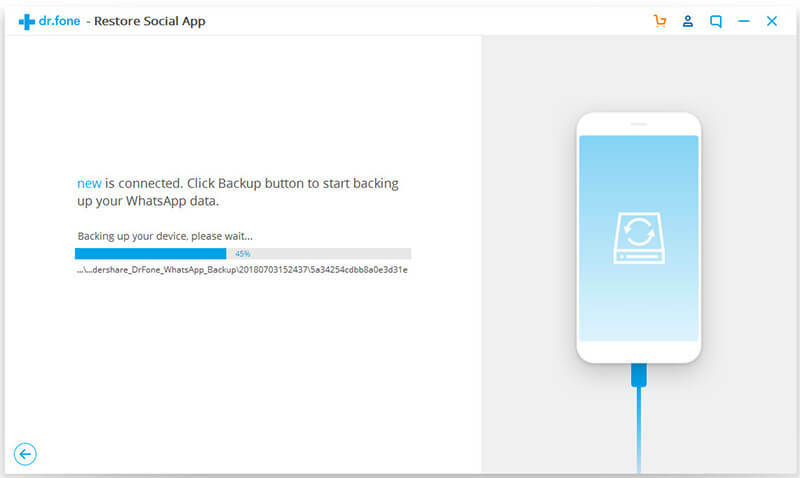 Now, click on the “Backup Now” button and confirm your choice to take an extensive backup of your device. While it is easy to backup WhatsApp photo and other types of data this way, you would face unwanted problems restoring the data. A third-party iOS backup extractor would be needed to fetch the WhatsApp chats and restore them to the target device. After learning some solutions to take a backup of WhatsApp data on iPhone, let’s consider the same for Android devices as well. Since all the Android phones are connected to a Google account, you can easily maintain WhatsApp backup on Google Drive. Here’s how you can do it. Launch WhatsApp on your Android phone and go to its Settings > Chats. In some versions, it is listed as “Chats and Calls”. Tap on the “Chat Backup” button to explore the option. To take an immediate backup, tap on the “Backup Now” button. You can tap on the “Backup to Google Drive” option to link your WhatsApp to your Google account and take its backup on the Drive. After maintaining a backup on Google Drive, you can restore it to an Android device. While setting up your WhatsApp account, enter the same number and WhatsApp will automatically detect the existing backup file. A lot of people don’t know, but you can also maintain a backup of your WhatsApp chats on the local device storage as well. The feature is only available for Android devices. 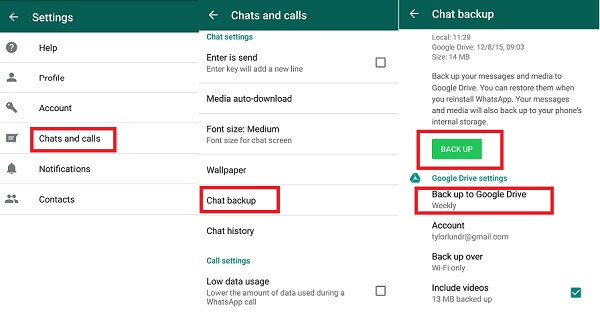 When you visit the Chat Backup option on WhatsApp and take a backup on Google Drive, a duplicate copy is also maintained on the local device storage. 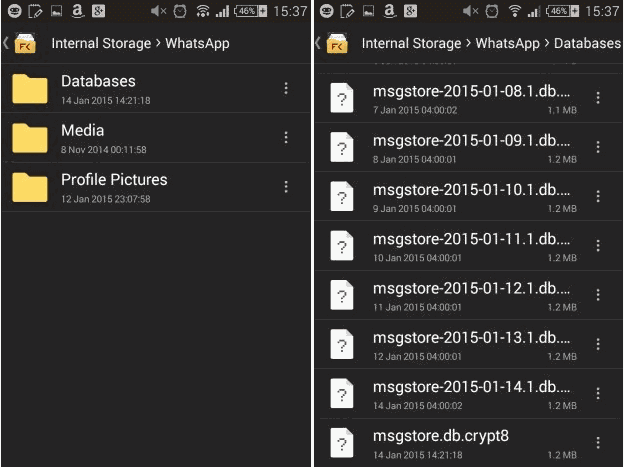 You can use a file manager and go to the Internal Storage > WhatsApp > Database folder. Here, you can view backup files with a .db extension. Simply copy the backup file and keep it safe at a secure location. Now when you know five different ways to backup WhatsApp photos, videos, and chats, you can easily keep your data safe. Once the backup is maintained, you can use dr.fone – Restore Social App (iOS) to recover it as well. 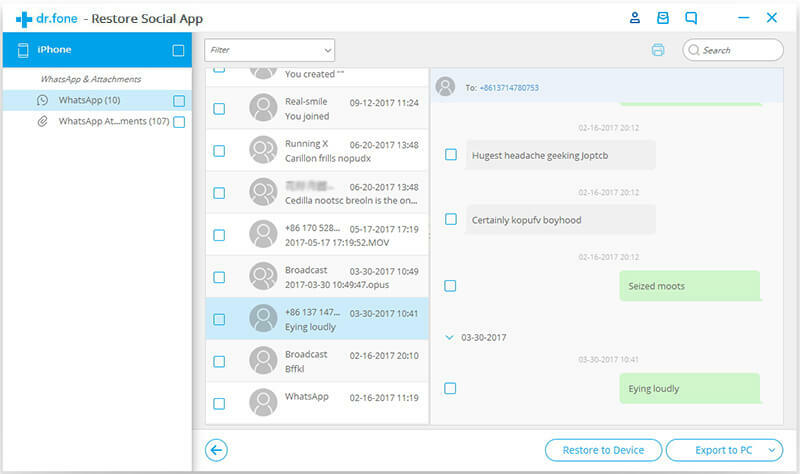 It is a complete solution to backup, transfer, and restore WhatsApp data that will certainly come handy to you on different occasions.